George Poveromo (shown with dolphin) was host of the Saltwater Sportsman’s national fishing seminar series this Saturday at the Casey Theatre, Regis College, MA. Capt. 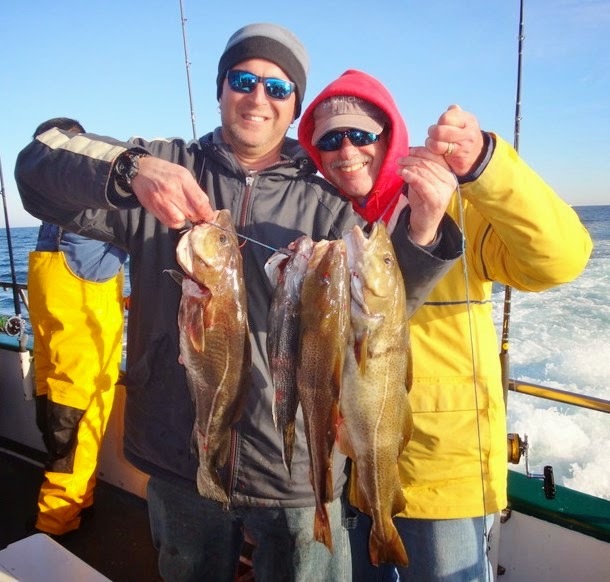 Lois DeFusco of Hot Reels Sportfishing charters, Pt. Judith, RI likes using jigs for black sea bass. How do I get started tuna fishing? How do I catch large black sea bass? What lures work best for striped bass in the spring? These questions and others were answered Saturday at George Poveromo’s 28th Salt Water Sportsman’s National Fishing Seminar series held at Regis College in Weston, MA. Poveromo is an editor-at-large for Salt Water Sportsman and is the host of George Poveromo’s World of Salt Water Fishing television program on NBC Sports. Poveromo and co-host Tom Richardson, host of New England Boating TV and former editor at Salt Water Sportsman led panel discussions on a variety of fish species on how, where and when to catch them. Dr. Mitchell Roffer of Roffer’s Ocean Fishing Forecasting Service (www.roffs.com) was one of the national speakers. Dr. Roffer is an authority on locating productive water surface temperature breaks and ocean-circulation features for near shore and offshore game fish. His satellite images provide anglers with maps showing real time temperature breaks and water circulation patterns. National and local captains like Louis DeFusco of Hot Reels Sportfishing charters (www.hot-reels.com), Pt. Judith, RI provided anglers with information on how to enhance their odds of catching more and larger fish. DeFusco’s favorite places to target tautog include reefs off Beavertail, Jamestown and Brenton Reef, Newport. “Around Thanksgiving I am fishing n in 65 to 70 feet of water. In the spring and early fall they are in 10 or 12 feet of water.” said DeFusco. With prizes from national sponsors such as Bass Pro Shops, Mako boats and Penn reels/rods and many others Poveromo’s National Seminar series was a big hit with anglers once again here in New England. Visit www.nationalseminarseries.com for the seminar schedule as it visits other east coast locations. The annual Kevin Thatcher Memorial Ice Fishing Tournament will be helped Saturday, January 31, 7:00 a.m. to 2:00 p.m. at Crystal Lake. The tournament will benefit “Between the Cracks.”, a local non-profit charity that helps families in need. Crystal Lake Golf Course, Big Bear Bait & Tackle and Ted’s Bait Shop are tournament sponsors. The entry fee is $10 and sign-up will start at 6:00 a.m. at the Crystal Lake Golf Course parking lot on Rt 202, Bronco Hwy on the Burrillville/Glocester Line. Cash prizes for the largest bass, pickerel and perch. Best cook on the ice award will receive the “Golden Pork Chop Trophy”. Contact Steve Rawson for information at 401.568.4244. The Rhody Fly Rodders will meet Tuesday, January 20, 6:30 p.m. with Capt. Ray Sachelek of Cast-a-fly Charters as guest speaker. Capt. 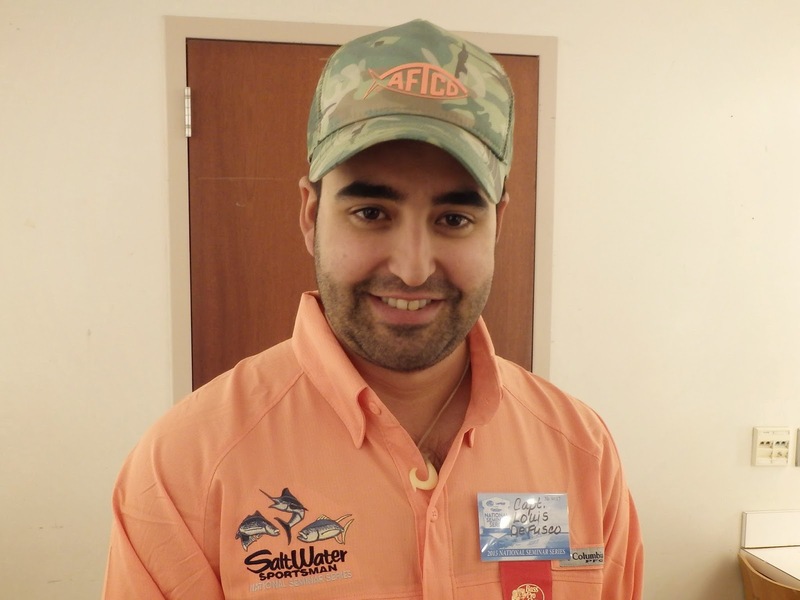 Sachelek (a noted fly fishing guide and tyer) will give a presentation called “Tuna Helper – A Recipe for Success”. Peter Nilsen, president of Rhody Fly Rodders said, “The presentation will be all about the hunt for false albacore, bonito and small tuna. This will be a comprehensive presentation with a wealth of information on the subject.” Seminar is open to the public. The meeting which will take place at the Riverside Sportsmen’s Association, 19 Mohawk Dr., East Providence, RI is open to the public. For information contact Peter Nilsen at 401-245-7172. The Atlantic States Marine Fisheries Commission (ASMFC) held an input meeting at the URI Bay Campus last week on Draft Addendum XXVI for the summer flounder fishery management plan (FMP). The ASMFC develops management plans and regulations for summer flounder fishing in RI and other coastal states. The meeting was chaired by Kirby Rootes-Murdy, ASMFC fishery management plan coordinator. Robert Ballou, one of Rhode Island’s ASMFC commissioners from the RI Department of Environmental Management, interested recreational anglers as well as representatives from the Rhode Island Party & Charter Boat Association (RIPCBA) and the Rhode Island Saltwater Anglers Association (RISAA) were in attendance. Travis Barrio, RISAA board member and representative said “We are advocating for adaptive regional management like last year allowing Rhode Island to be separate and not making it accountable for fish caught in other regions along with guidelines for one year rather than two.” Capt. Rick Bellavance, president of the RIPCBA said, “We are concerned about the options that bring RI into the same region as other states, mostly because of the uncertain data and how dramatically it can change from year to year. Combining with others could reduce our (recreational) bag limit to even less fish and shorten our season by quite a few days.” Capt. Bellavance has also disputed the accuracy of the Marine Recreational Information Program (MRIP) data used to measure effort and catch to develop harvest estimates. Both the RISAA and RIPCBA were in agreement on the summer flounder management plan options the ASMFC should consider for Rhode Island. Summer flounder abundance has moved north in recent years as the ocean water has warmed. So you might say climate change has impacted this fishery in a positive way for Rhode Island fishermen. With this abundance shift and the importance of the species to both commercial and recreational fishing in Rhode Island, fish managers believe it is time to look at old and new data and science to consider changes to the way summer flounder are managed. A summer flounder management plan amendment that address a lot of these issues is in the works for the future. Last year a public scoping meeting on the issue was held. However, the scoping meeting is just one of the first steps in the long process of amendment development. It will be followed by selection of key issues, a draft amendment and implementation options as well as a number of public hearings. However for the time being, 2015 will likely bring more restrictive fishing regulations for recreational anglers in RI as the summer flounder projected relational harvest was overfished last year. In 2014 the projected harvest was 126,724 fish and through Wave 5 fish managers say Rhode Island’s share of the regional harvest was 181,601 fish. The ASMFC board plans to select management measures and approve them next month (February) at their next. Public comment on the draft addendum (which can be found at www.asmfc.org) can be sent to Krootes-murdy@asmf.org , the subject title in the email should read: Draft Addendum XXVI. For ice conditions in your city or town check with local police and at Olney Pond in Lincoln Woods State Park, call DEM's Division of Parks and Recreation at 667-6200. DEM has an ice safety guide that can be found online on its parks website at www.riparks.com . Angler Kenneth Westerfeld of Bayside, NY with his 28.8 pound tautog. 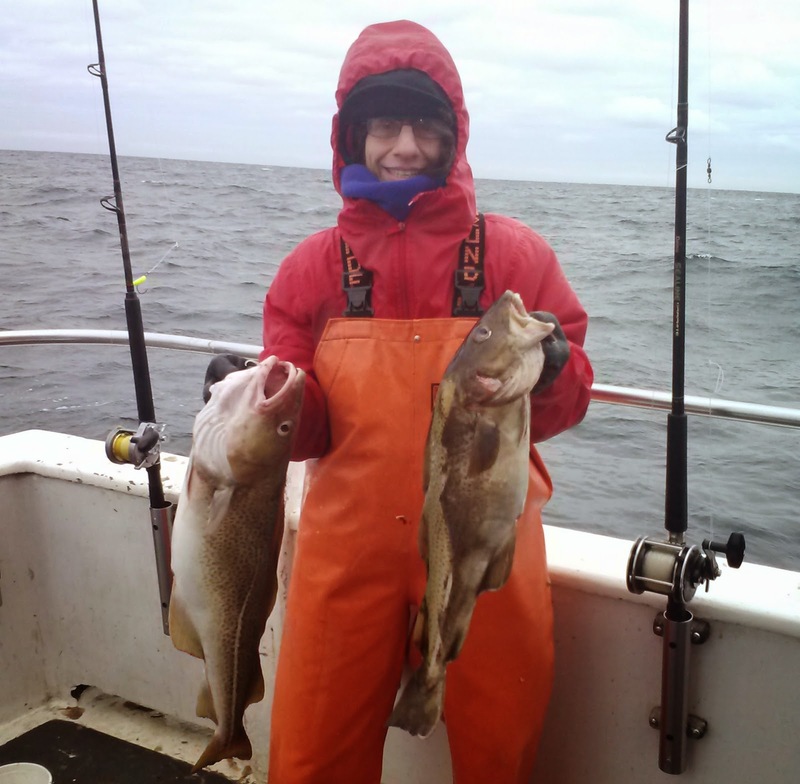 Matt Kryszczynski from Stamford, CT with cod fish he caught on the Seven B’s Saturday. Last Friday Kenneth Westerfeld of Bayside Queens, New York landed a 28.8 pound, 35” tautog which if verified will be the new all-tackle International Game Fishing Association (IGFA) world record. The current world record of 25 pounds was set in 1998 by Anthony Monica fishing out of Ocean City, New Jersey. The Snafu rig, often used when targeting large tautog is a double hook rig where two hooks on either end of an eighteen inch line are placed in one crab with the sinker and leader to the main line tied into a loop in the middle so the crab sits on the bottom when fishing. Visit YouTube and search for Snafu rig to learn how this rig is tied and used. It is no longer legal to fish for tautog in Rhode Island as the recreational season ended December 15, 2014, with the spring season scheduled to start sometime in April, 2015. The Narragansett Surfcasters is having their 2nd Annual Surf Day and Used Tackle Sale Saturday, January 24, 2015, 9:30 a.m. to 3:00 p.m. at the Narragansett Community Center, 53 Mumford Road, Narragansett, RI. “This is a great opportunity to pick up quality tackle at a reasonable cost, attend three great seminars and have some food and refreshments.” said Cliff Richer, club vice president. Maintenance by Dave Morton of Beavertail Reel Repair at 11:30 a.m.; Kayak Fishing by Capt. Howard Reed of Narrow River Custom Rods/Galilee Bait & Tackle at 12:30 p.m. and Fishing the Block and Cuttyhunk by Tommy McGuire at 1:30 p.m.
Food will include Rocky Point famous chowder & clam cakes, chili, meatball sandwiches, hot dogs, etc. $3.00 admission donation for adults for the club’s "Take a Kid Fishing Day". For information visit www.narragansettsurfcasters.com . The Department of Environmental Management (DEM) plans to stock eight ponds with 3,000 trout this week for the winter fishing season. Carbuncle Pond, Coventry; Olney Pond, Lincoln; Barber Pond, South Kingstown; Silver Spring Lake, North Kingstown; Upper Melville Pond, Portsmouth; and Round Top Ponds, Burrillville will be stocked with trout. “Even though there is no ice currently, we have had many beautiful days for fishing this winter. Getting out in the fresh air is a great way to start the New Year and generate excitement for Opening Day in April.” says Catherine Sparks, assistant director for Natural Resources. A current fishing license and a Trout Conservation Stamp are required to keep or possess a trout. The daily creel and possession limit for trout Dec 1, 2014-February 28, 2015 currently stands at two per day. How do you know if ice is safe? Ice must have a uniform thickness of at least six inches before it is considered safe by DEM. It generally takes at least five to seven consecutive days of temperatures in the low 20’s for safe ice to form. In addition to the requisite cold temperatures, ice thickness is also determined by factors such as the size and depth of a pond, presence of springs or currents, and local temperature fluctuations. For ice conditions in your city or town check with local police and at Olney Pond in Lincoln Woods State Park, call DEM's Division of Parks and Recreation at 667-6200. Visit www.riparks.com for an ice safety guide. Party boats sailing for cod fish at this time include the Seven B’s at www.sevenbs.com, the Frances Fleet at www.francesfleet.com and Island Current at www.islandcurrent.com. Steve Brustein and Capt. Dave Monti with the fish they caught at Cox’s Ledge on the Seven B’s party boat out of Pt. Judith, RI. 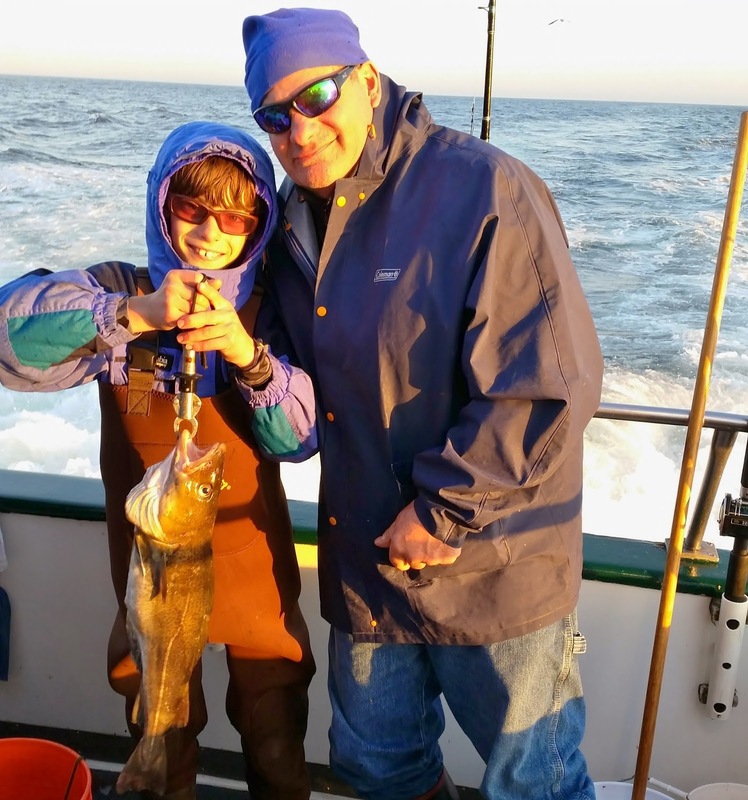 Mitch and Doug DiPalma of Wakefield, RI with eleven year old Mitch’s first cod caught on the Seven B’s Saturday. 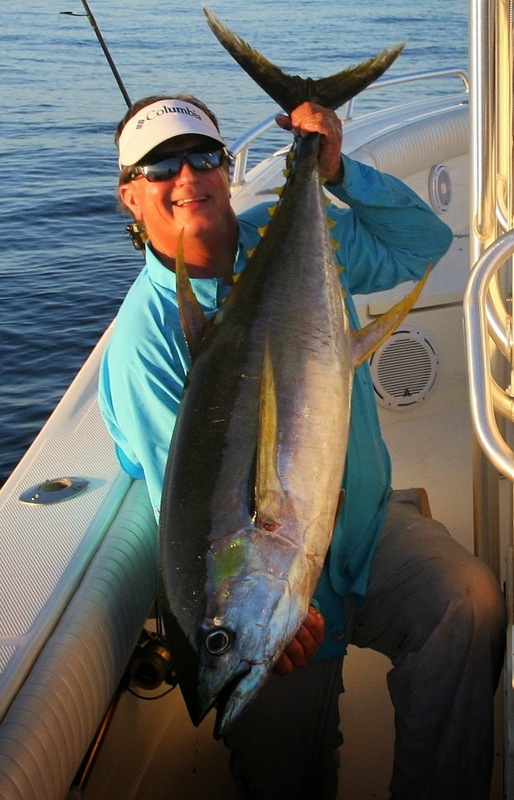 The Saltwater Sportsman’s National Fishing Seminar Series with host George Poveromo (shown with yellowfin tuna) will be held Saturday, January 10 at the Casey Theatre, Regis College, Weston, MA. George and Mike Fotiades of Narragansett, RI with the cast net they use to batch bait for fishing. “Ever since George was three years old he had a curiosity for fish at the shore. As he got older he would catch them with a hook and line or net them and if that didn’t work he would throw rocks at them. His fascination for fish at the shore got us (me) interested in catching our own bait.” said Michael Fotiades of Narragansett, RI. 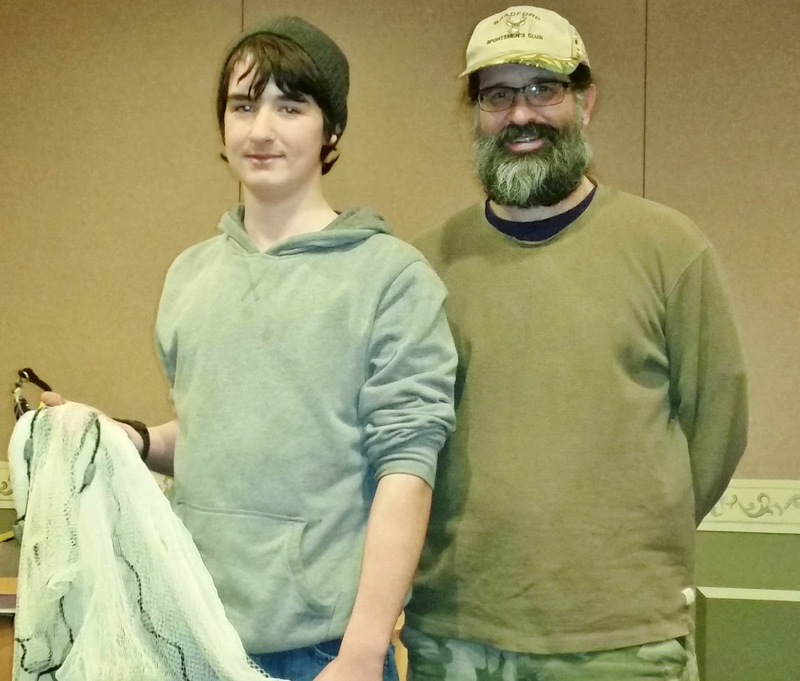 Mike and his 13 year old son George spoke about catching, keeping and fishing with live bait Monday night at a Rhode Island Saltwater Anglers Association (RISAA) meeting. “You need to catch bait where you are going to fish. What is in the water is what the fish are eating. So if you catch bait (silversides or mummies) in upper Narragansett Bay and then travel to a new location in the lower Bay to fish it is not necessarily going to work as the fish may not be feeding on that bait in the new location.” said Michael Fotiades. Small baits commonly caught in this area with nets or traps include silversides, bay anchovies, sand eels and mumichogs or killifish. Larger bait fish caught with nets or hook and line include chogee or cunner, mullet, Atlantic menhaden, shad and scup. “You need to follow the recreational fishing regulations even if you are catching the species for bait.” said Fotiades. For example the scup limit this year was 30 fish/angler/day at a 10” minimum… so that is all you cn catch for bait as well as human consumption. To keep bait live the overarching tip is temperature and oxygen. “The idea is to keep the bait you catch at the same temperature and water oxygen level. This may mean using a bait well with a circulator or simply changing or adding water to a bait bucket every 15 or 20 minutes.” said Fotiades. The presentation finale was handled by George Fotiades who demonstrated how to prepare and throw a cast net. The idea is to start with a small net (five or six feet) and practice, then step up to larger nets eight, nine and ten feet, which are more difficult to throw. “We often use this five foot net. And we catch all the bait we can use.” said Fotiades. There are a number of YouTube videos on how to throw a cast net and there seems no one right way to throw one. I searched for “how to throw a cast net” and found several helpful videos on the subject. The Saltwater Sportsman’s national fishing seminar series with host George Poveromo will hold its New England seminar Saturday, January 10, 9:00 a.m. to 3:00 p.m. at the Casey Theatre at Regis College (235 Wellesley Street, Weston, MA). 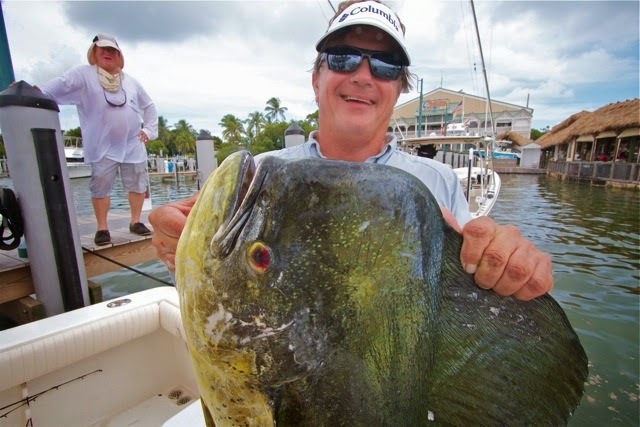 Poveromo is an editor-at-large for Salt Water Sportsman magazine and is the host of George Poveromo’s World of Saltwater Fishing television program on NBC Sports. The $55 seminar fee includes a day of fishing instruction from local, regional and national fishing captains and guides, a course text book, a year subscription or extension to Salt Water Sportsman magazine, goodie bag, door prizes and more. Register at www.nationalseminarseries.com. Just prior to leaving the dock at 6:00 a.m. Capt. 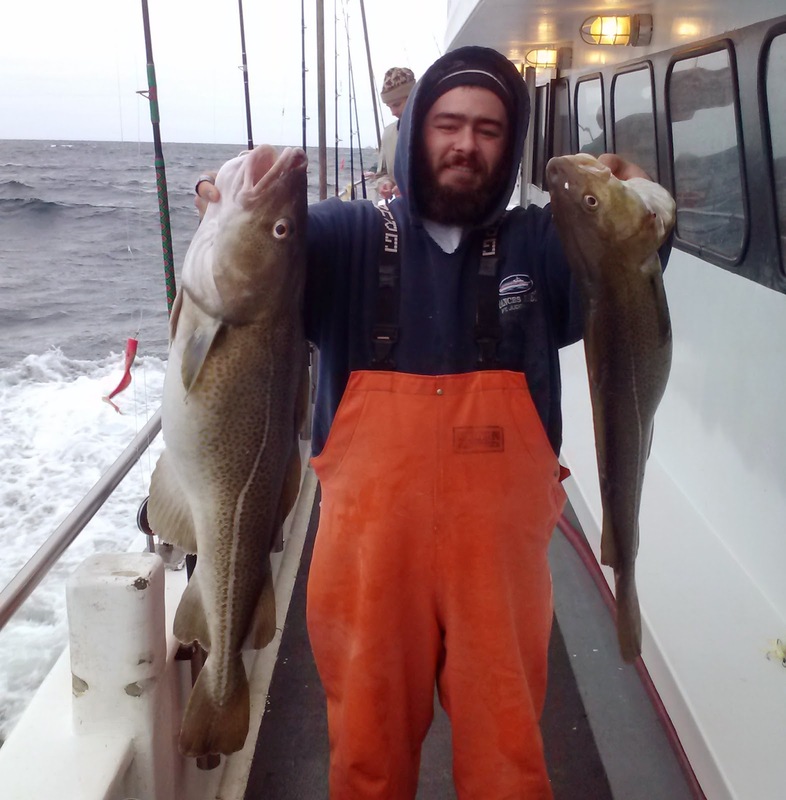 Andy Dangelo said, “This is our fist cod trip of the season and it is a sellout… we have a full boat. Now we’re going to try to find the cod.” And he did taking his 55 passengers to the northern end of Cox’s Ledge about 20 miles south, southeast of Pt. Judith. It took us about two hours and fifteen minutes to get to the fishing grounds where we were joined by other party boats… from the Frances Fleet, the Island Current and the Viking (from Montauk). Capt. Andy Dangelo moved the boat several times, each time some of the passengers would catch a fish or two. The weather was great and I heard no complaints on the boat… some anglers caught one to three fish and some top anglers landed six or seven keepers. Dave and his son Mitch Aster from Fitchburg, MA enjoyed the day too. They boated several sea bass and cod. “We fished with the Seven B’s in September because the Frances Fleet boats were full and we were glad we did the crew was very attentive. We had a great time, so this is why we returned to the Seven B’s today.” said Dave Aster. Cod fishing is great fun for adults and children. So if you think fishing is over, think again. I know I will be keeping my eye on the weather and when the temperature gets to 45 or 50 once again I’ll be grabbing my fishing rod and gear for a trip to Cox’s Ledge for cod. Big tag game: Kevin Robishaw and Al Anderson with Capt. 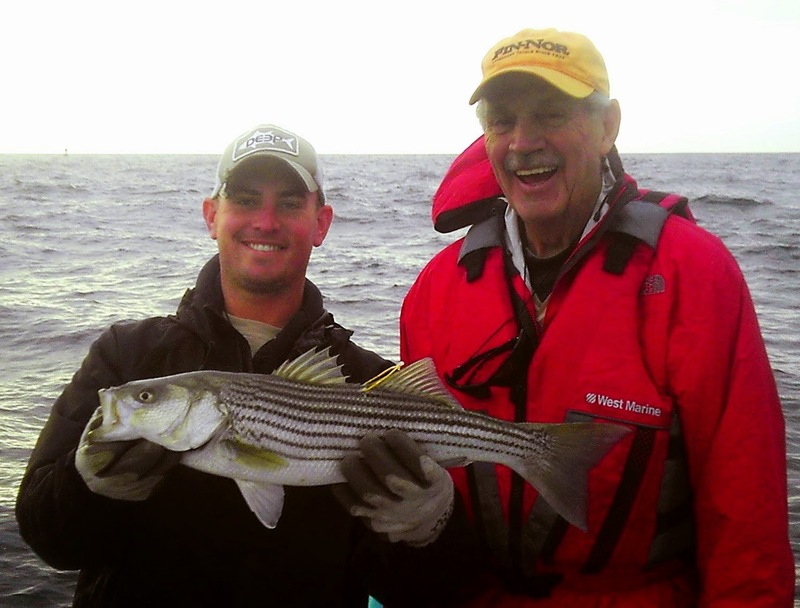 Al’s 60,000th tagged game fish… a six pound striped bass caught this summer on Block Island Sound. Mike Raganzo of Providence, RI with the pool winning cod he caught last week aboard the Gail Frances party boat out of Pt. Judith, RI. Troy Bique of Ashaway, RI jigged up this cod Saturday when fishing a Frances Fleet party boat out of Pt. Judith, RI . Capt. Anderson, who recently retired from charter fishing, credits his long-term clients with offering some of their catch up for tagging. Now he’s tagging fish from his seventeen foot Boston Whaler. In 2012 he was inducted into the International Game Fish Association’s (IGFA) Hall of Fame for his ethic of fisheries conservation through tagging. Nice job Capt. Anderson, we are proud to have such an acclaimed conservationist here in Rhode Island. NOAA Fisheries is developing guidelines for safely deterring marine mammals and is asking for angler input. The Marine Mammal Protection Act (MMPA) section 101(a)(4)(A) allows for private citizens to employ measures to deter marine mammals from damaging fishing gear and catch, damaging personal or public property, or endangering personal safety, as long as these measures do not result in death or serious injury of marine mammals. The MMPA also directs the Secretary of Commerce, through NOAA Fisheries, to develop national guidelines on safely deterring marine mammals under NOAA's jurisdiction including whales, dolphins, seals, and sea lions. The comment period is open until January 15, 2015. Review guidelines and comment at http://www.regulations.gov/#!docketDetail;D=NOAA-NMFS-2014-0146. Good news for commercial fishing vessels and charter boats. Last week President Obama signed into law the "Howard Coble Coast Guard and Maritime Transportation Act of 2014," exempting small fishing vessels from the EPA's National Pollutant Discharge Elimination System (NPDES) discharge permit requirements. The law extended the exemption provision for three years. The regulation was intended to prevent fuels, toxic chemicals, or hazardous waste from entering the water. Senator Lisa Murkowski (R-Alaska) told the Alaska Journal of Commerce that requiring a permit for fishermen to hose down a boat is overkill - especially when recreational boats, including mega-yachts - are exempt from the rule. "We want to abide by environmental regulations that make sense," Senator Murkowski told the Journal, "But I don't think any of us believe it should be a requirement for a fishermen who has had a good day out on the water, and they are cleaning up the boat, and hosing slime and maybe some fish guts off the deck and that then becomes a reportable discharge to the EPA.... Let's use some common sense here." This Monday, December 29th, 7:00 p.m. at the West Valley Inn, West Warwick, RI the Rhode Island Saltwater Angers Association (RISAA) will present a seminar on catching your own bait. In this seminar Michael and George Fotiades will cover the types of bait that can be found in Rhode Island, how to catch them, how to keep them alive, and tips for fishing with them. Cast nets will also be covered in depth - how they work, how to choose one, where to use them, and how to throw one. The seminar will be followed RISAA’s 17th annual meeting. Non-members are requested to make a $10 donation to the RISAA Scholarship Fund. Optional dinner from 5:30 p.m. to 6:30 p.m. served by the West Valley Inn. The Coastal Resources Center is looking for focus group participants to help them improve the quality and content of their website. They are looking for people who both have and have not previously accessed our website. People chosen to participate in the group will receive a light breakfast, a CVS gift card and some Coastal Resources Center prizes. For a chance to be chosen to participate in one of their focus groups visit http://tinyurl.com/CRCFocusGroupSignUp2015 . If you have questions contact Jim Blair at 724.877.0517 (or blairj4@my.uri.edu). Party boats sailing for cod fish at this time include the Frances Fleet at www.francesfleet.com , the Seven B’s (with Capt. Andy Dangelo at the helm this week) at www.sevenbs.com, and the Island Current at www.islandcurrent.com . 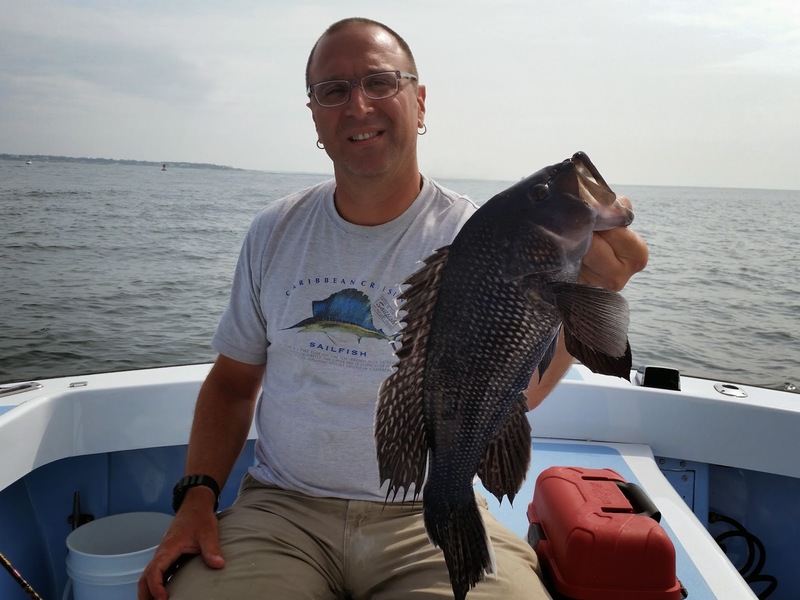 Black sea bass like this one caught by angler Steve Burstein of West Warwick are plentiful but RI quotas are tight. Regulations have not caught up with migrating fish. Ever wonder why black sea bass quotas are so low, yet fishermen catch so many? Or why it’s easy for Rhode Island to overfish summer flounder quotas? Why cod has moved offshore or why cobia, a warm water exotic fish, is now being caught in our waters more than ever before? It all has to do with our oceans warming which has caused fish populations to move north and/or into deeper cooler water. You can now track 80 northeast species (650 in total) on a new Rutgers University website called OceanAdapt at http://oceanadapt.rutgers.edu . How warm is the water? URI Bay temperature studies confirm that Narragansett Bay has warmed 2 to 2.5 degrees depending on time of year in past 45 years. “Since 1854 ocean temperatures on the northeast continental shelf have risen 1.3 to 2 degrees Fahrenheit.” said Dr. Jonathan Hare, director of the National Oceanographic & Atmospheric Administration’s Narragansett, RI Laboratory. Dr. Hare and Dr. Malin Pinsky of Rutgers University’s Institute of Marine and Coastal Science have developed “OceanAdapt” which is a collaboration between the Pinsky Lab at Rutgers and the National Marine Fisheries Service (NMFS). The OceanAdapt website provides information about the impacts of changing climate and other factors on the distribution of marine life. The website hosts an annually updated database of fisheries surveys and provides tools for exploring changes in marine fish distribution. “We found that all over North America, marine fish and invertebrates are shifting their distributions quite rapidly,” said Dr. Pinsky. OceanAdapt allows anglers to search and download data on the geographic and depth ranges of fish and invertebrates by region and track how those distributions have changed over time. This data is a valuable tool for the fishermen, fishery managers, and scientists who are grappling with the challenge of adapting fishing regulations to a changing climate. Visit the OceanAdapt website and experiment. It is easy to use. I ran data graphs on black sea bass, summer flounder and cod. The most telling graphic for me was looking at the movement and depth change of all east coast species together… the shift north was dramatic. As a fishermen and fish policy advocate, OceanAdapt gave me a better understanding as to how fishing in Rhode Island has been impacted by climate change and how fishing policy and regulations have to be flexible and change faster to adapt to climate change. Last week the Mid-Atlantic Fisheries Management Council (MAFMC) and the Atlantic States Marine Fisheries Commission (ASMFC) had a joint meeting to discuss summer flounder (fluke), black sea bass and scup. These two organizations have a direct impact on fishing regulations in Rhode Island as some of our species fall under the MAFMC and migratory species that travel the east coast are regulated by the ASMFC. Scup saw liberalization in Federal waters with the recreational catch limit increased to 50 fish, scup regulations will likely be liberalized in RI waters too. The Atlantic States Marine Fisheries Commission’s 2015 Winter Meeting has been scheduled for February 3-5, 2015 at the Westin Hotel in Alessandria, VA. The agenda is available online at http://www.asmfc.org/home/2015-winter-meeting. Meeting materials will be available on January 23, 2015 on the Commission website. Agenda highlights include such items as winter flounder plans, Atlantic herring, American lobster, Atlantic menhaden, weakfish and big decisions are on the agenda for summer flounder, scup and black sea bass. The Striped Bass Management Board meeting is scheduled for Thursday, February 5 from 8:00 a.m. to noon. The key agenda item to be discussed and considered for approval are Addendum IV Conservation Equivalency Proposals and Implementation Plans which coastal states have been working on. Rhode Island is expected to submit a plan that would allow the party and charter boat industry to take two fish at 32” or 33” minimum size which is expected to surpass the 25% reduction mandated by the new striped bass conservation equivalency threshold. Coastwide one fish at 28” was approved by the ASMFC for recreational anglers which is a 31% reduction. Other states may opt for a two fish solution for recreational anglers in general and/or charter boats as long as they meet the “conservation equivalency” reduction goal of 25%. More conservative anglers want to stay with the one striped bass fish at 28” regulation for 2015 while other recreational fishermen (and states) want to meet the 25% reduction goal but do it with two fish rather than one even though the two fish would have to be a larger minimum size. 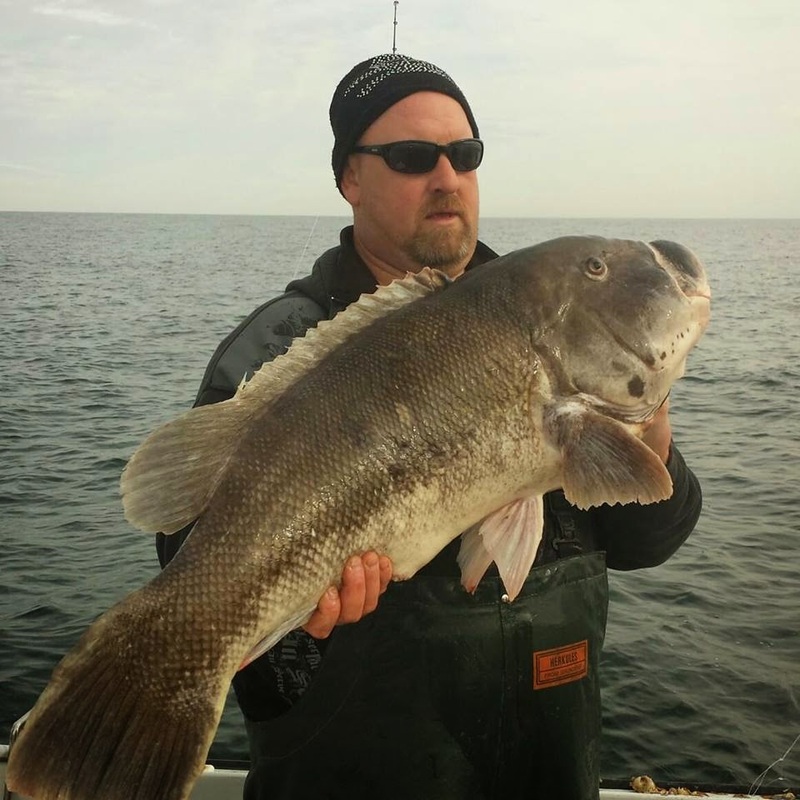 Tautog season closes, cod and black sea bass fishing still good. 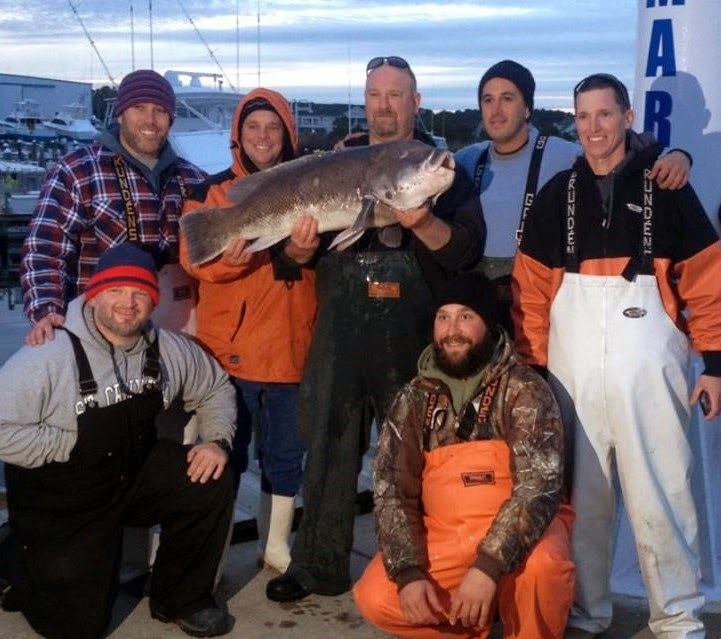 The tautog fishing season closed December 15th. 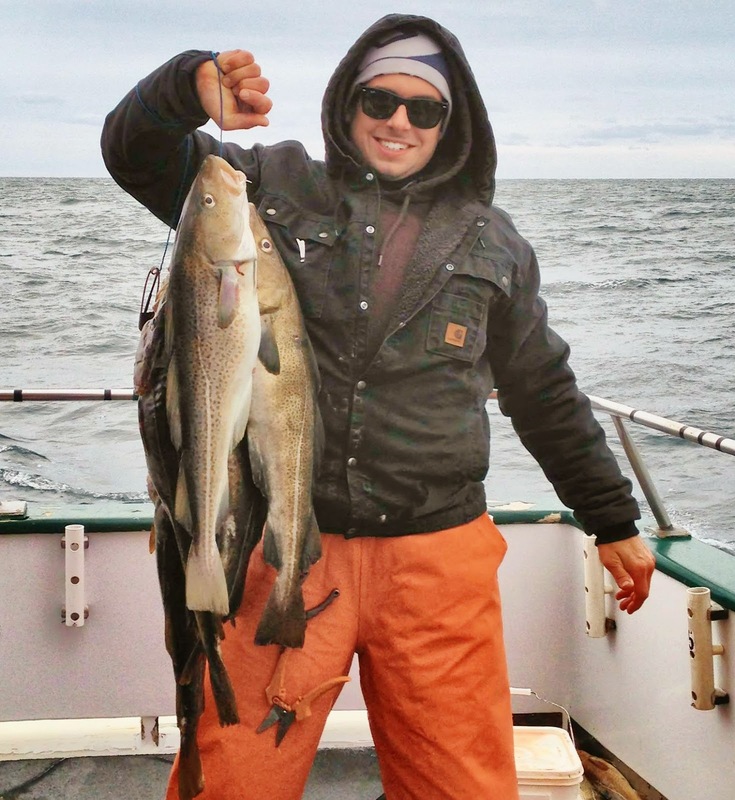 Angler Larry Norin reports a slow cod bite off Jamestown and Newport last week. This weekend the Frances Fleet had good cod and black sea bass trips. Capt. Frank Blount said, “Weather sidelined us for a good chunk of the past week. Friday saw a pick of nice green market cod to nearly ten pounds and a decent amount of keeper sea bass with a bunch of sea bass limits. One angler did really well with the cod boxing 8 nice keepers and while his score was not representative of the average, most of the anglers aboard did leave with a cod fish...On Saturday's run the cod fish were a bit more evenly distributed around the boat. Hi hook boxed four keepers and two other anglers recorded three keepers apiece. The sea bass bite was very good as well with many anglers limited out and they were much bigger average size than the day prior. A lot of jumbos in the 2 to 3.5 lb range with a handful of bigger ones to over 4 lbs.” Elisa Martin of Sung Harbor Marina, South Kingstown said, “The Island Current party boat started sailing this weekend form our docks, too early to tell how they doing. The only other highlight was our customer appreciation holiday party last week on. The fish chowder continues to be a big hit with customers.” Party boats sailing for cod fish at this time include the Frances Fleet at www.francesfleet.com , the Seven B’s (with Capt. Andy Dangelo at the helm this week) at www.sevenbs.com, and the Island Current at www.islandcurrent.com .